Set on the grounds of the sprawling Amberly Estate stands a royal gem shining brightly, yet quietly tucked away in the tranquil elegance of the Chesapeake Bay area of Maryland’s Eastern Shore. Hunters Oak Golf Club a division of The River Plantation is a look back in time, and at the same time, a modern, state-of-the-art facility disguised as an Scottish links-style course and 18,000-square foot manor home, with our professional staff looking after your every need. So close to Baltimore, Washington, D.C., Philadelphia, Virginia and Delaware, yet so far away in spirit and feel, Hunters Oak is the perfect retreat to play golf, entertain clients and friends, or simply escape the hustle and bustle of the normal routine. The centerpiece of this majestic treasure is our par-72 Scottish links-style golf course. Complete with meandering berms, never-ending mounds, seemingly inescapable pot bunkers, and slick-surfaced greens, Hunters Oak measures at just over 7,000 yards when you play the back tees. 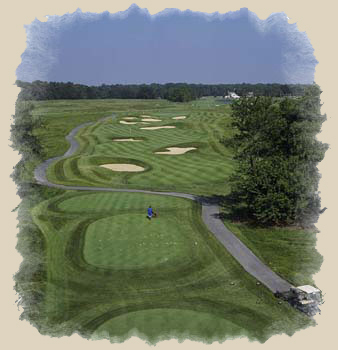 Fairways are made of the finest bentgrass, meticulously maintained to our demanding standards. In fact, Washington Golf Monthly called it the “most unique golf course in Maryland”. Each hole is truly different and is named in the traditional fashion, such as “Big Ben”, “Wee Boggle” and “Old Tom”, and our spectacular par-5 finishing hole “Lion’s Den”. 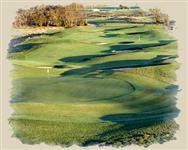 There are some golf courses where one or two holes stand out in your mind after play. At Hunters Oak, there are 18 truly distinctive holes that you’ll be talking about in the clubhouse and boasting about to friends and associates back home. As a member you can enjoy playing tennis on our state-of-the-art courts. If you’d like to take a swim after a round or to help you stay in shape, use the olympic sized pool to do some laps or simply take a break. You can also “head to the gym” right here at Hunters Oak, with our fitness facility boasting the latest equipment to keep you at peak performance.